On May 27, 2009 Vandenberg was sunk to become the largest artificial reef in the Florida Keys National Marine Sanctuary, and the second largest in the world. In order for such a large ship to be sunk like that there has to be a lot of planning and research. 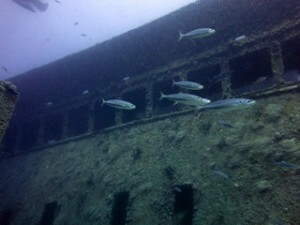 REEF was asked to do surveys on the Vandenberg site before the ship was sunk to see how it would affect the marine life and reefs. REEF stepped up to the challenge and assembled their Advanced Assessment Team made up of all level 4 and 5 fish surveyors. 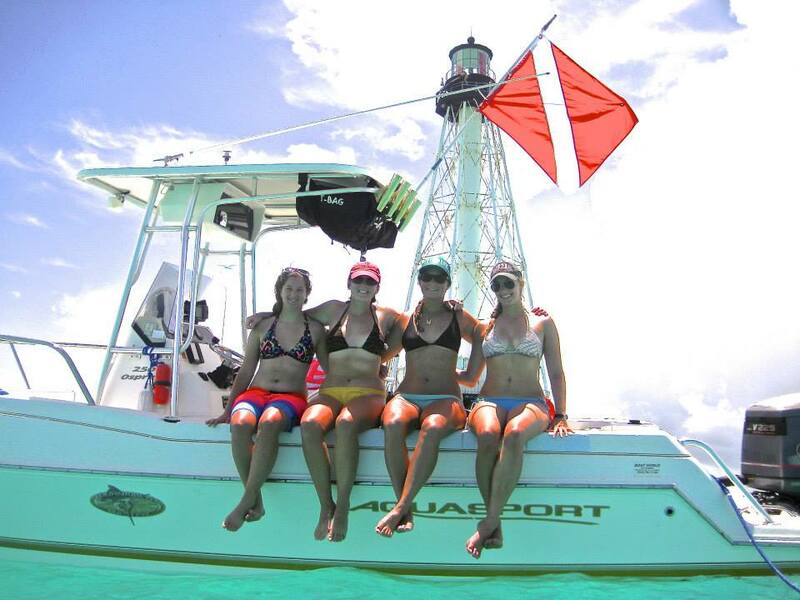 The Advanced Assessment Team (AAT) is a group of highly qualified fish ID experts who volunteer their time to do fish surveys that would be more accurate than an entry level fish surveyor. The team surveyed the Vandenberg site and multiple sites around it before the sinking and we have been keeping up with our long term survey plan. 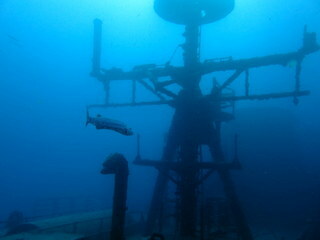 The sites we survey around the Vandenberg are to compare reef structure and look at impacts of other wrecks. As interns we have not quite gotten to the AAT level but we were invited to join and help out with the research. The Vandenberg is located off the coast of Key West which is around a two hour drive from where we are in Key Largo. I was lucky enough to be able to join the survey crew for four out of their five days of surveys. I really enjoyed all of the sites and getting to work with such experienced researchers. My favorite day was our last day when we surveyed the Vandenberg again and Joes Tug. 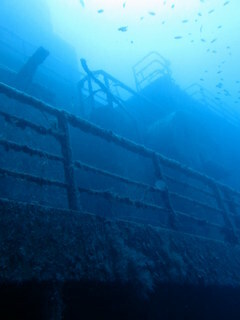 When we went down for our first dive in the morning, there was zero current and almost 100ft of viability. It was absolutely amazing. 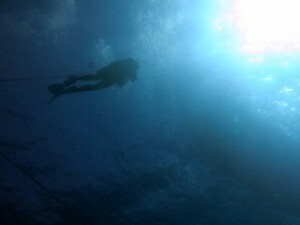 We wanted to stay down there all day, but due to the depth we only had a short time. I am really glad I had the opportunity to work with the Advanced Assessment Team again and hopefully I will be able to join them again and even become an AAT member myself. This entry was posted in 2014 Reef Environmental Education Foundation on September 3, 2014 by Jessica Schem. 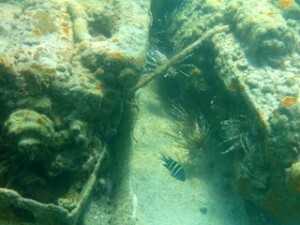 Blue Heron Bridge is located past Fort Lauderdale and is a beautiful little boat channel. Most people know it as just a fun little place to swim or fish, but some of us know it as the best place to find critters! 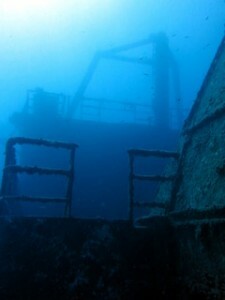 Blue Heron is not your typical Florida reef dive; it is actually nothing like it. 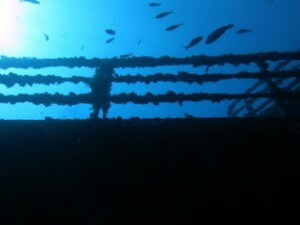 It is a very shallow dive, with the max depth at around 12 feet, and it is all sand with giant pillars from the bridge forming structure for critters to hide. 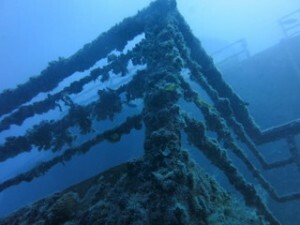 When I was first told about this dive we talked about how there was an active boat channel right next to where we would be diving, and about how it is a muck dive and the current can sometimes pick up so the viability will go way down. 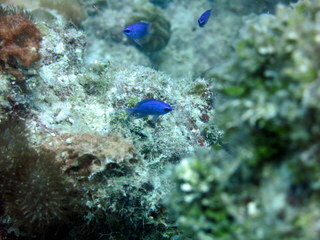 So I must admit that I was a little apprehensive about the dive. Fortunately, I was in great hands and all the things we talked about were just for safety and to prepare us for what to do. After driving three hours to get to Blue Heron, we finally entered the water around 11. We had to time the dive right so we would be there for slack tide and the current didn’t wash us out to the boat channel. 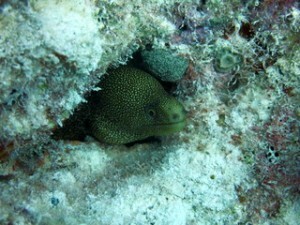 After going over our dive plan, we headed out. I was told that there were a lot of things dumped in the water like shopping carts or old sunken boats, and I questioned why people would want to make the three hour dive to stare at some trash, but after I got out there I began to understand. 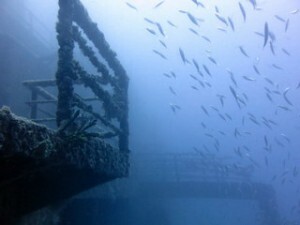 All the big structures that were thrown into the water provided habitat to tons of animals I had never seen before. 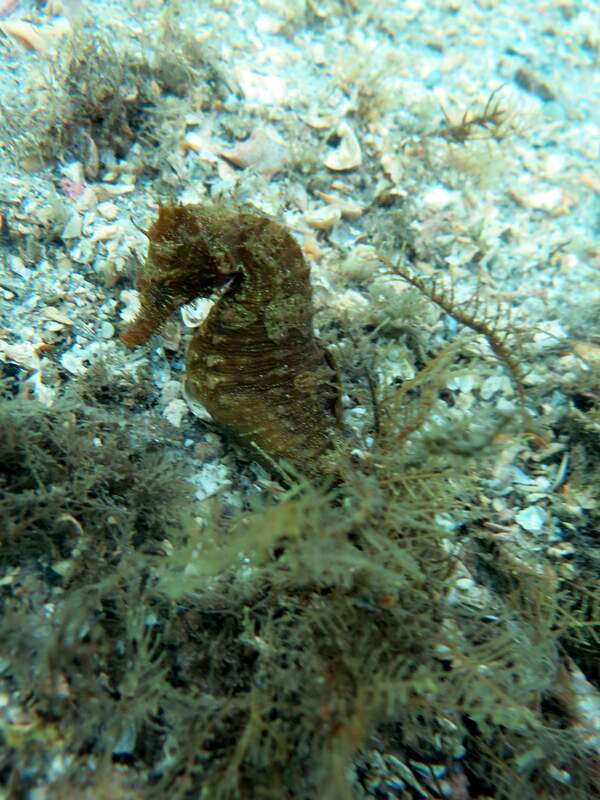 When we began our dive we had talked about what we wanted to see the most and of course I knew exactly what mine was; a seahorse! I had never seen a seahorse before, and was beginning to think that they were a myth, but sure enough half way through our dive I hear someone tapping on their tank to get my attention. 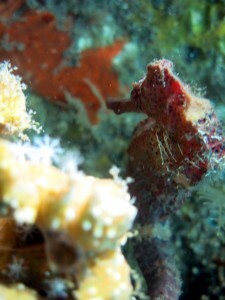 I quickly swim over and see a tiny pink seahorse holding on to a piece of algae with its tail. Needless to say I did my little underwater happy dance and had everyone laughing. Not only did we see this little guy but we also found another on our way back in! I am so excited to cross that off my critters to see bucket list (nerd alert). Some other critters that I was equally excited to see on my dive were two octopi, a few sea robins, and a flying gurnard. 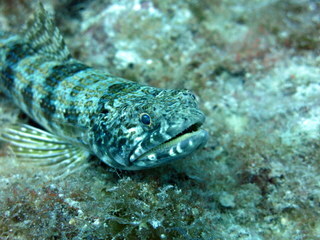 The dive was two hours long and while it wasn’t the prettiest dives I have been on, it offered a chance to see some amazing rare species and I hope to go back soon to find more. 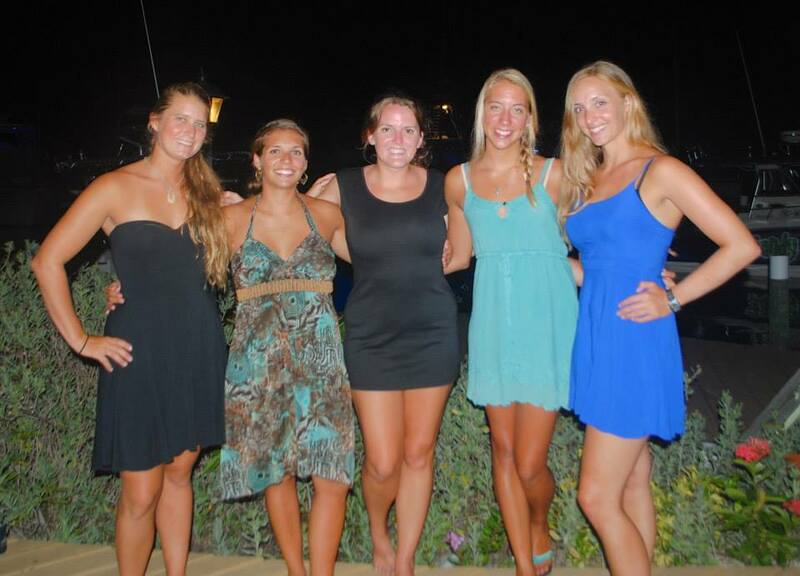 This entry was posted in 2014 Reef Environmental Education Foundation, Internship Journeys on August 18, 2014 by Jessica Schem. The Great Annual Fish Count is an event that takes place across the world every year during the month of July. 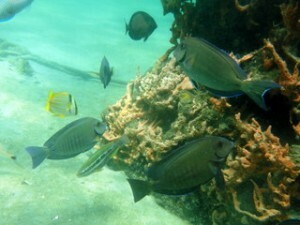 It is organized by REEF to help get people in the water and counting fish. This year another intern and I took the lead on this project for the Florida Keys and coordinated a fish ID talk and dive. REEF cannot do what we do best and preserve the oceans without the help of citizen scientists. This is why we try to spread the idea of doing fish surveys to as many people we can. 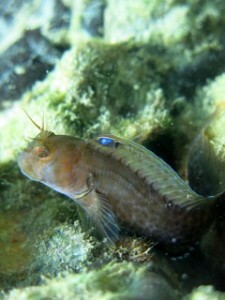 As I mentioned in one of my other blogs, volunteer fish surveys are one of the main projects at REEF. It is actually pretty easy and anyone interested can partake with the right training. 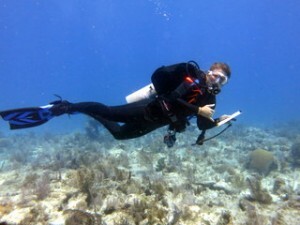 We use a roving diver technique, which means that the diver does a regular dive and while they are swimming around they write down all the fish they see and their abundance. For the Great Annual Fish Count, we hosted a fish ID class where we taught the public about the most common fish here in Key Largo, Florida. 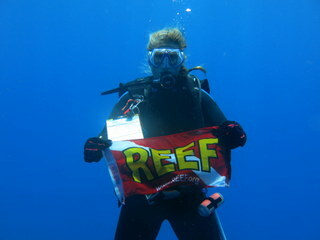 REEF is a worldwide organization and we do surveys in every ocean. For Florida, however, we are grouped into the Tropical Western Atlantic or TWA. After we taught everyone about their fish, we set up a day to go out on a dive boat where we provided underwater paper, slates and pencils to anyone interested in doing a survey. 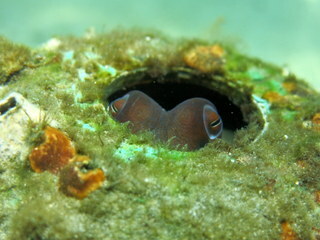 We had a great turn out, with many people interest in doing a survey and learning about REEF. 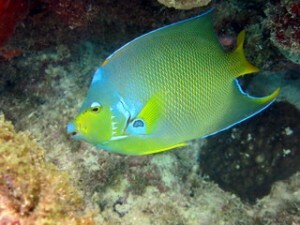 I loved being able to see people getting as excited about fish ID as I am. There was a father out diving with his two sons and it made my day watching them point to a fish and swim over to me and ask me what it was. After I told them their eyes would light up and they would quickly check it off their list. 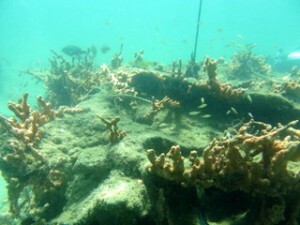 I am glad that so many people were interested in going out and preserving our reefs. 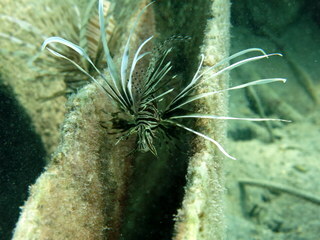 Lionfish derbies are one of the big ways that REEF helps with controlling lionfish abundance. 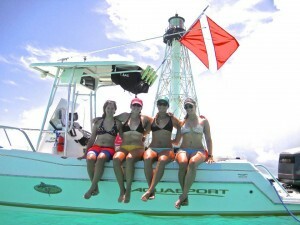 During the summer REEF hosts a series of derbies all around Florida and in the Caribbean that are open to the public. Lionfish derbies consist of many different teams that go out for the day and bring back as many lionfish as they can. 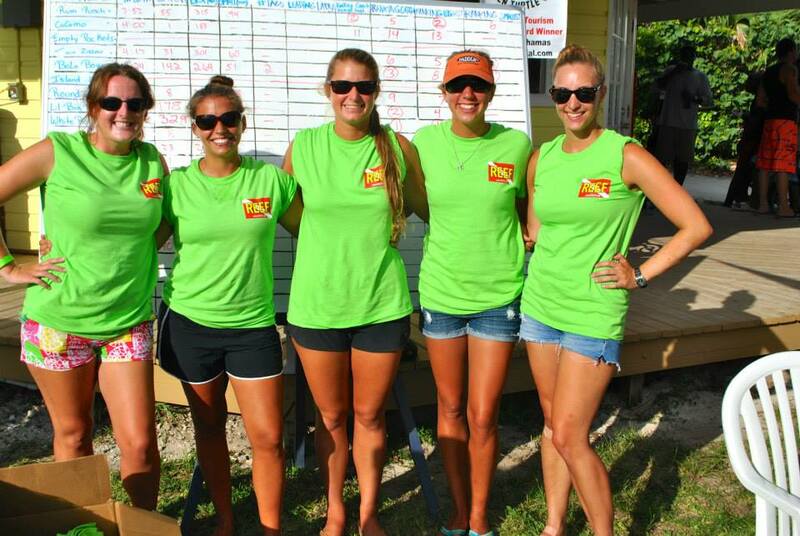 This year I was lucky enough to help run the Green Turtle Cay Derby in the Bahamas! Green Turtle Cay was actually the first place to host a lionfish derby and we are excited that they have held one every year since. Along with the derby, REEF has been doing some monitoring research to see the effectiveness of derbies. For the whole week prior to the derby our REEF team surveyed around 80 sites looking for lionfish and doing predator/prey surveys as well as fish counts. This research is being done to see how much impact derbies have on the control of lionfish. The research was very interesting and I look forward to seeing the results after we analyze the data. After a long day of research we get to enjoy the sunset! As for the actual derby, we have tons of teams going out throughout the week to scope out their best lionfish sites, but the real fun starts on Friday. Each team must have a member present at the Captains Meeting on Friday night to hear all the rules and regulations. The captains’ meeting is where teams that are not preregistered sign up and tons of people walking around buying raffle tickets or REEF merchandise. I love all the competition in the air as each team tries to talk up how many fish they will be catching the next day. After the captains meeting, the teams go home to hopefully get a good night’s rest before the start of the derby at sunrise. 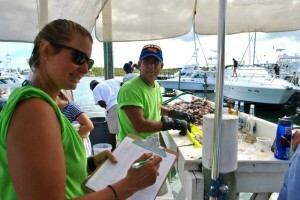 Teams go out all day in hopes to collect the most lionfish and win any of the cash prizes. There are prizes first through third in the categories; most, biggest and smallest. All the teams must be back at the dock by 4:00 sharp. This is when they bring all their fish up and we size them and count them. It’s always crazy with the amount of fish being brought in and everyone running around checking the score board to see whose winning. This year we had 907 lionfish come in, a great improvement over the previous years! Something interesting that we noticed was that more of the fish were on the small size, this could mean that the derbies are really effective in keeping the population down and that we are only finding the new juveniles of the year. Hopefully all our research will show how much derbies are helping control the population of lionfish and how the hard work of all our participants is really helping the reefs. Although REEF tries its hardest to keep us interns busy, we are still able to make it out on the reef for some perfect weather. The other day we went out with our lovely friends Carlos and Allison to a little place they call Alligator. 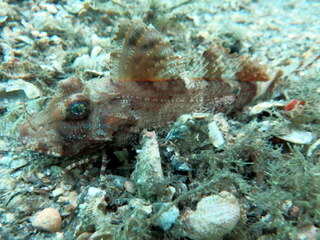 The conditions were amazing; it was the kind of conditions you wait all year for; sunny, no current, glassy surface and clear to the bottom. 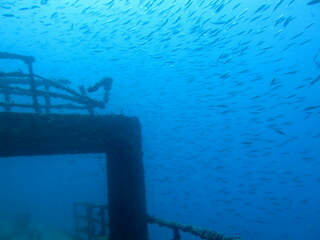 When we first hopped in we were surrounded by a halo of silversides and herring. 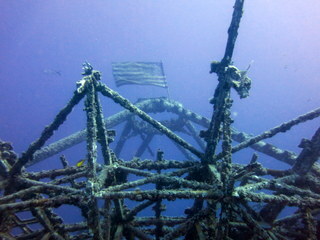 I had to wave my hand out in front of me to make them move so I could see the bottom, which was about six feet below me. I still can’t believe that I have this awesome job. We snorkeled around the lighthouse for a few hours doing fish surveys, while being serenaded by the great Jimmy Buffet from the radio of a neighboring boat. It was hard to not get distracted but I was able to finish 3 separate fish surveys. Fish surveys are one of REEF’s major programs where citizen scientists go out and write down on underwater paper all the fish that they see and their abundance. 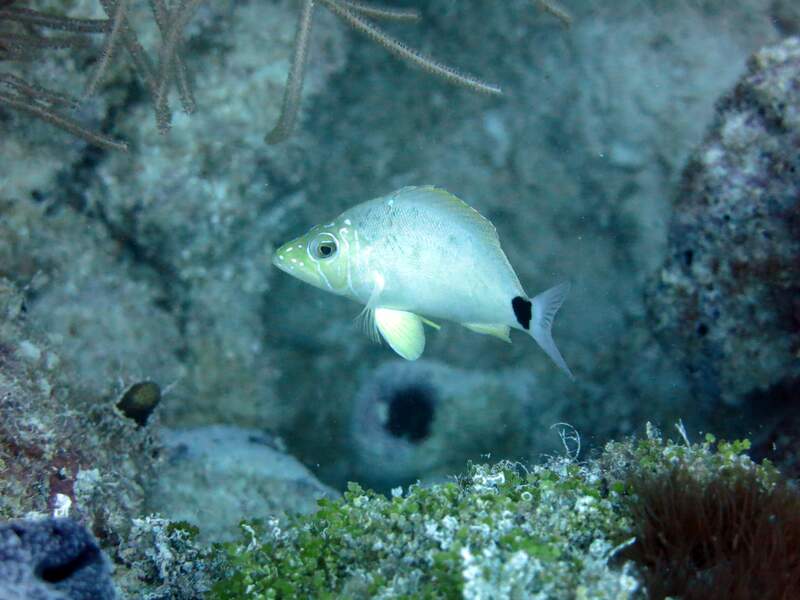 With the help of all the fish surveyors over the years we are able to look at the species and abundance and get a better idea of the status of our reefs. In order to become a fish surveyor and help save our reefs all you have to do is become a member and know at least one fish! There are many different levels which you can work your way up to with fish quizzes and number of surveys. 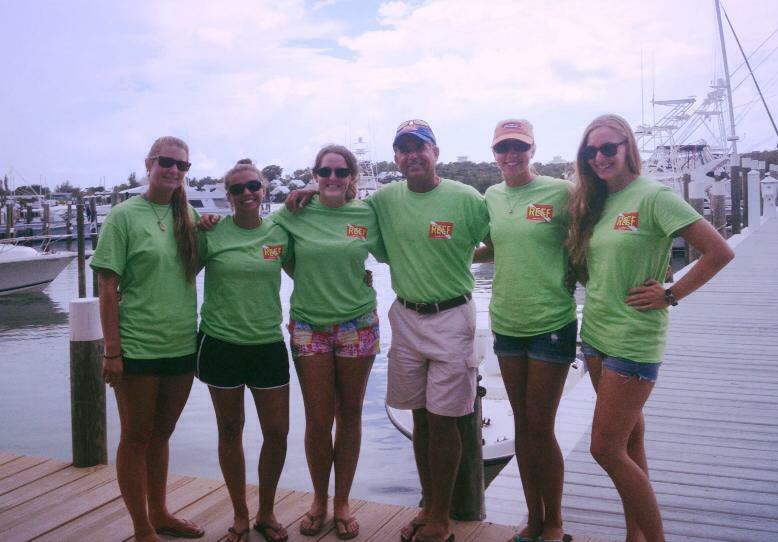 Our summer intern goal is to be level four fish surveyors (part of the Advanced Assessment Team) by the end of our internship, which some say is a hefty goal, but we are excited to take on the challenge. 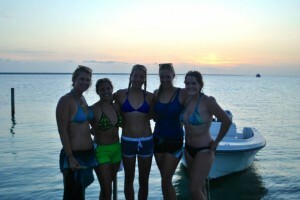 After our fish surveys at Alligator we hung out in the water and just took in the beauty. Coming from California, I am still trying to get used to this feeling of being warm in the water. So far I think I’m doing a good job! Our beautiful trip was only cut short by the fact that another intern and I had to wake up at 3 to catch a flight to the Bahamas!!! Rough life I live, I know! But someone has got to do it! 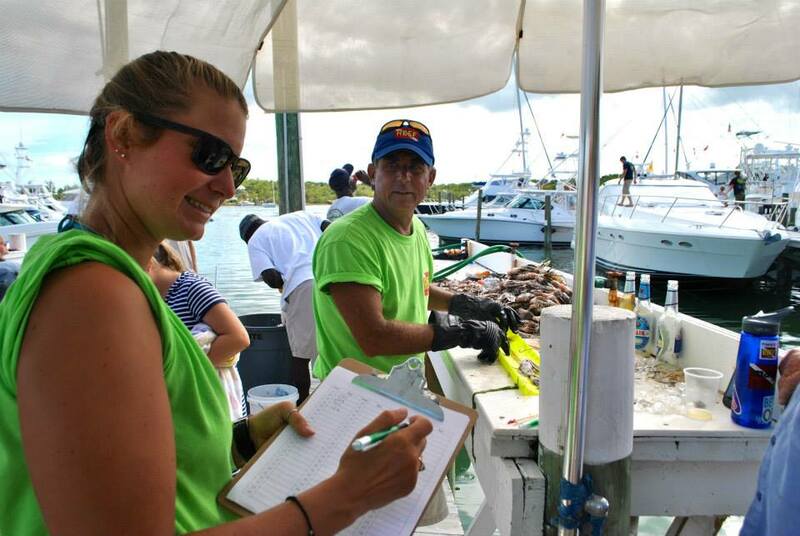 When we get to the Bahamas we will be doing lionfish surveys and tagging at Green Turtle Cay all leading up to the lionfish derby that will be held on Saturday! 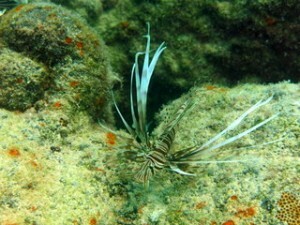 Lionfish derbies are big community fishing events to help control the lionfish population. 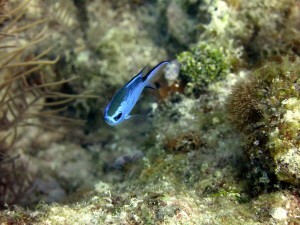 I will be back soon and will hopefully have great stories to tell about the Bahamas! 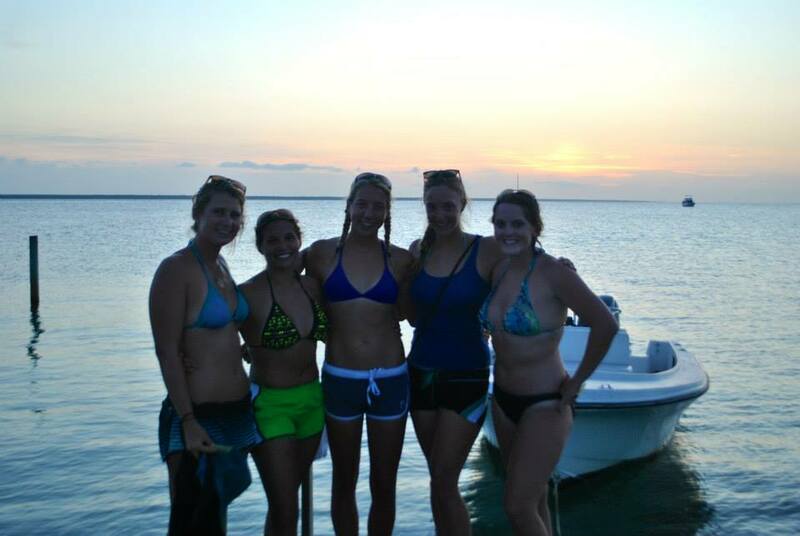 The REEF girls out at Alligator!! 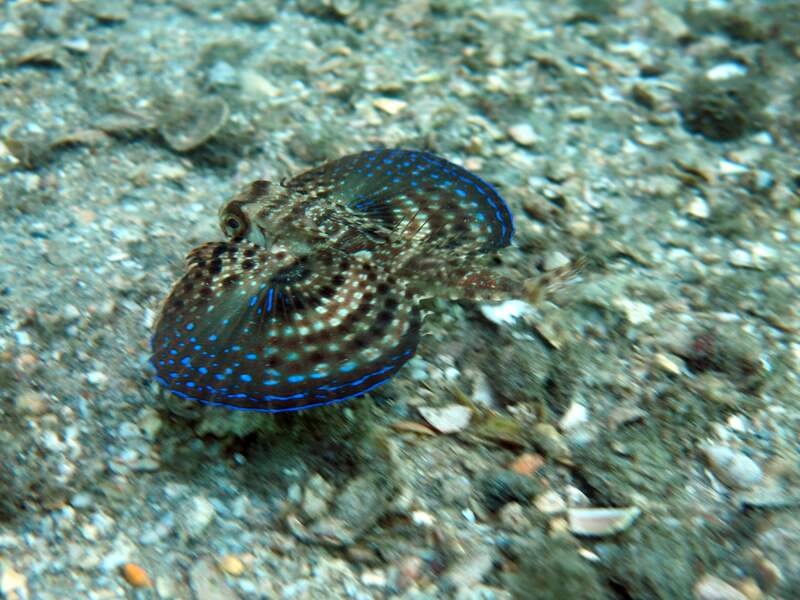 This entry was posted in 2014 Reef Environmental Education Foundation on August 11, 2014 by Jessica Schem.